We love the months of April and May as it’s a great time to celebrate for two very important reasons. In addition to Mother’s Day, April is a month of joy as it’s Angee’s birthday month! There’s no better reason than to celebrate by having a giveaway for our supporters! For this Giveaway, we are doing things a little differently. We are estimating that we’ve handmade over 1500 clutch bags since we opened shop in January 2009! Over the past 2 years, we have sent our clutch bags to over 15 countries around the world. This giveaway is our way to thank our supporters and customers for trusting us and believing in us for the making of their clutch bags carried on either their big day or special date. 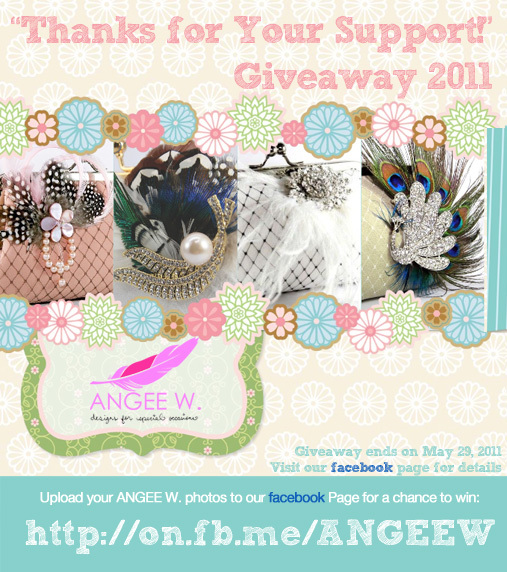 It’s really easy to enter this giveaway, simply share a photo of you with an ANGEE W. clutch bag on our facebook page. Depending on how many entries we get, we might give out up to 5 clutch bags to 5 lucky randomly selected winners! – Your photos will only be displayed on our facebook page and will not be used elsewhere without your consent.